goto misperry youtube website and search for "google assistant auto startup" video. He does a good job showing how to write a script for auto start up. I had to change the part where he said to type "google-assistant-demo& ....to get in running in the background." I had to add the "registration information" project id and device Id name. This information can be taken from the registration setup on the google SDK developer website. the guide shows you how to register your device so the google assistant can work right. This additional step is due to the recent update of the SDK as of yesterday. I have added one line to the crontab. The official method is to create a file called main.py (by copying one of the examples or creating a new file) and execute the install-services.sh script (in the scripts folder). will turn on the service and have it run at boot. Yes, mpember is correct. Please do not use (or spread) methods involving `crontab`, `rc.local`, etc. Raspbian (like all modern distrobutions) uses systemd, and that is the way we do this. For reference I will add a few links. HACKING.md explains how to enable the included services. Those instructions assume you have follow the prior instructions on that same page to install the service scripts. If you have done so, then you can make a copy of assistant_library_with_local_commands_demo.py called `main.py` (in that same location). Thank you RichardBronosky & mpember. You have saved the day. Worked like a charm at my end! Mar 02 17:52:50 raspberrypi systemd: voice-recognizer.service: Service hold-off time over, scheduling restart. Mar 02 17:52:50 raspberrypi systemd: Stopped voice recognizer. Mar 02 17:52:50 raspberrypi systemd: voice-recognizer.service: Start request repeated too quickly. Mar 02 17:52:50 raspberrypi systemd: Failed to start voice recognizer. Mar 02 17:52:50 raspberrypi systemd: voice-recognizer.service: Unit entered failed state. Mar 02 17:52:50 raspberrypi systemd: voice-recognizer.service: Failed with result 'exit-code'. Try "main.py" saved in the examples directory... in the same directory where the demo example that you copied and renamed "main.py" resides. Hi. I am a noob, so please bear with me. I got the same error message as joostvb after checking the status of the .service file I made. What should I do? That's got Miss Google listening on my RPi3B+ at every boot. You can change her into Mister Google with, "OK Google, change your voice" ... <wait for response> ... then say, "Yes". Hi Dougie, did you install the Voice hat manualy? I never do it myself but i wait to use my new 3 B+ very soon. 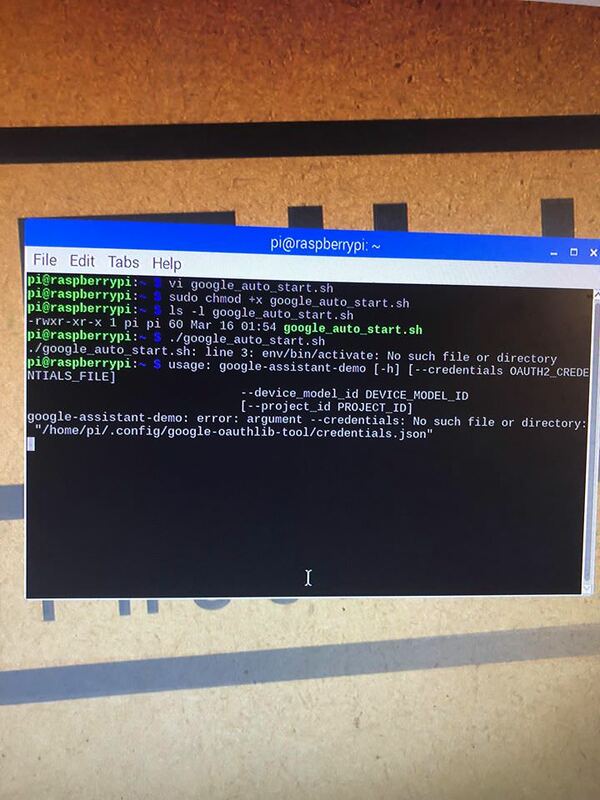 I installed it by git clone https://github.com/google/aiyprojects-raspbian; ln -s aiyprojects-raspbian AIY-projects-python. That's so I got the latest stuff from Dr. Google including ten month's worth of software fixes and enhancements. I'm running it on my "early support" RPi3B+, which I've had since the start of February. Ho, it is simple like a git clone? Cool. Because i am french, i use the cloud speech api only. I will send a feedback when it’s ok. But my auto start always fails.... I got the feeling that env/bin/.... does not work correctly with the current image... Can you help me? then back ON, and that's it! Anyone else running into the DBUS X11 display issue when attempting this setup? It appears it expects to run under a live graphics terminal session. I found this explanation -- and it implies it isn't really a "bug." They suggest that apps that use pulseaudio, for example, should ignore the error and continue to run, but it appears this demo app from Google does not. I can try to implement their suggested workaround in the launch script, but was curious if others had found a better solution. Thank you so much garyst1981! I looked and I looked for a solution to no avail. That is until I cam across your post. However, I did have to mod your solution slightly to get past the enabling step. Hey John, i met exactly the same problem like yours, did you figure out how to deal with it? I fixed it by running the assistant from the LXDE autostart. Did you miss this: viewtopic.php?p=1415892#p1326621 ?